Club Mahindra Ashtamudi Resort located on the shores of Ashtamudi Lake in Kollam district The resort is spacious and overlooks the beautiful landscape views of Ashtamudi Lake, Club Mahindra Backwater Retreat offers elegantly furnished apartments with free Wi-Fi access. It offers an outdoor pool, speed boat cruise, motor boat cruise, pedal boat ride, houseboat cruise, coir tour, temple tour, yoga & meditation, swimming classes, clay modelling and glass painting. Club Mahindra Ashtamudi resort Offers most Spacious comfortable accommodation ion 23 rooms and 2 suites that are spread across five chalets. All rooms are air conditioned with plush furnishing and attached washrooms Amenities include a mini refrigerator, tea/coffee maker, a wall mounted LCD television and a DVD player. Each room offers a picturesque view of the garden and the Ashtamudi Lake. 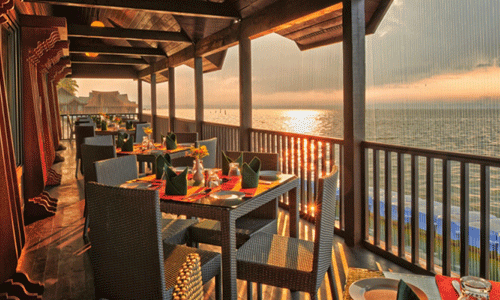 Club Mahindra Ashtamudi resort Offers mouth-watering seafood and local delicacies, served at the beautiful lakeside restaurant within the property. Room service facilities can also be availed here so that guests can dine in the comfort of their rooms. 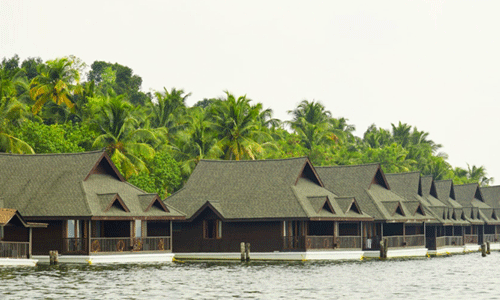 Club Mahindra Ashtamudi resort Located on the shores of Ashtamudi Lake in Kollam district about 30 minute drive from the Kollam Junction . Trivandrum International Airport is about an hours and 40 minutes drive from the hotel. Other interesting places that one can visit are Palaruvi waterfalls, Maha Vishnu temple and Thevally palace. If you have not decided yet or wants to customize tour itinerary or hotels listed above in "Club Mahindra Ashtamudi, Kerala", then we can change the travel itinerary and make a personalized, tailor-made holiday package, especially for you. We can modify this travel package as per your itinerary, budget, duration and the tourist places you would like to visit, including transportation and airfare should be included or not. Please fill the form below to contact us.